1300-mile Tour of Idaho with elan? No problem. 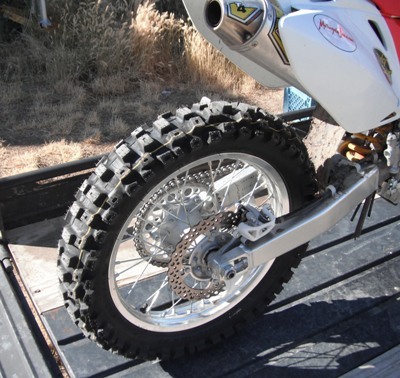 GeoMax MX71 front and rear tires are new hard terrain offerings from Dunlop that replace the venerable D745 and D739. Our initial impression is that the MX71's are just as long wearing as their predecessors but with much better handling characteristics - especially as they wear. 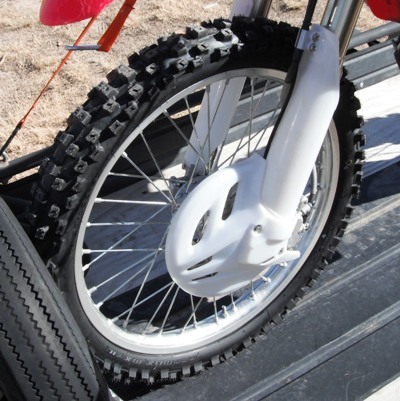 The first thing you'll notice about a fresh set of MX71's is how well they grip and steer for a hard terrain tire. We spooned a pair MX71's onto our MoJazz Project CRF450X for the Tour of Idaho T1 and were surprised with the crisp handling. We run our MX71's with Bridgestone heavy duty tubes at 16.5 psi front and rear. The favorable initial impression from both ends of the bike grew as the miles piled up and the tires remained compliant and responsive. After over 1000 miles of hard riding the rear tire, though well-shagged, still works. The front is in good enough shape that we are still riding it. Right now we'd be hard pressed to think about another tire we'd rather use for the type of riding we do - long, mixed and fast. The handling and durability are tough to beat. These tires have all of the excellent wear characteristics of the tires they replaced (which we really liked) but actually steer, go around corners and have some bodacious grip.